I really enjoyed this short novella about Trace and Boz. It's basically a prequel that takes place roughly 5 years before the first book in the series (The Curse of Jacob Tracy). It's a quick look at their budding friendship and the first time they run into a supernatural situation. They are leading a team of what passed for paleontologists in the 1880's to a dig. Some of the old bones are not what they are expecting. Much chaos ensues. Fun, fast read with two of my favorite characters. I can't wait for the next full length book in the series! Loved this prequel. This book was the first Old West historical fiction I've read that featured prehistoric archeology. I enjoyed that because at one point, I wanted to be an archeologist.I don't want to say too much for fear of spoiling the plot. But this much I will say: here begins the friendship of Jacob Tracy, a man who perceives the supernatural around him, and John Bosley, who is a pragmatist and very grounded. Although their journeys to this point are different, both have had their share of challenges and difficult times. I feel like this is the foundation of their friendship. I can't wait to see how it evolves in "The Curse of Jacob Tracy".One last thought: I do hope that Stanley Many Tounges makes an appearance in a future book. After being completely intrigued by the main characters in "The Curse of Jacob Tracy," I loved delving into Jacob's past and seeing the relationship between Jacob and Boz in its earlier stages. 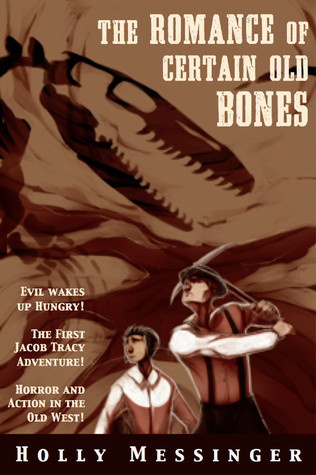 Supernatural thrills and fascinating characters keep the narrative moving -- I shall never again encounter large prehistoric fossils without wondering if I hear whispers of demons. This novella was enough to whet my appetite for more Jacob and Boz while still leaving lots of questions to be answered in future novels. Can't wait to see where they get to next! Holly Messinger - Holly Messinger started writing Madeleine L'Engle fanfic in the third grade, and by the time she completed her BA in English, had written more than a million words of original fiction. Her stories inevitably feature snarky female anti-heroes. In addition to writing, Holly has had a lengthy career as a costume designer, mostly making high-end superhero costumes for cosplayers. She appeared as a judge on SyFy's Heroes of Cosplay in 2013. Her short fiction credits include "End of the Line," which appeared in Baen's Universe; and "Moreau's Daughter," featured in Beneath Ceaseless Skies.